If David reads that. I am sorry ;( But I swear that if you send me one again I put it behind glas. 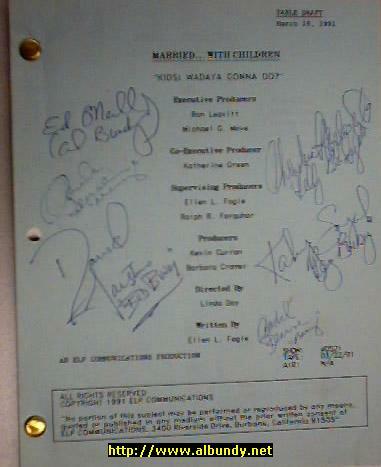 Just curious how did you come to own your signed script? Is it signed by Amada Bearse twice? Gucd231 wrote: Hopefully he's listening Daniel. Don't think so (for the Shirt we have been mailing - loooong time ago). I don't think that it is signed twice by her. But you can find a picture of it on the al Bundy Website itself. WOW! That had to hurt a bit. I'm not sure which would have killed me? Ruining my shirt or the wife cleaning the floor! Someone put my signed (not personalised) David Faustino shirt in the wash. Luckily most of it survived...! I took another look at it. Who's signature is below O'Neill's on the left and Sagal's on the right? Hehe, the pic is in a superb quality gggg *. I'll make a high res Scan when I am at home again. Daniel wrote: Hehe, the pic is in a superb quality gggg *. You have a perfect scan on your site. Yeah looks like 2x Marcy sigs! Yup! That's the one....very cool! Do you have other signed scripts? Gucd231 wrote: Yup! That's the one....very cool! Do you have other signed scripts? I have a lead on another signed script. I'll make thread if I manage to obtain it.